Another boutique hotel is coming to the South End, this one with an unusual spin on the city’s history, from fine arts to disco. The company will do it through an array of interior exhibits and art to be installed throughout the mid-rise building, which Mount Vernon bought for $17.2 million in 2014. Early images show rooms decorated with paintings by historic Boston artists, overlaid with the titles of songs by Boston music legends such as Aerosmith and Donna Summer. 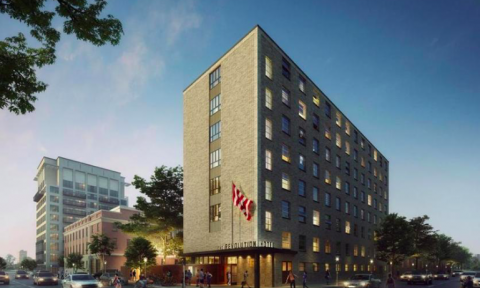 The hotel aims to attract younger travelers and creative types to the property, a former YWCA and then a hostel where many of the smaller rooms lacked private bathrooms. To help encourage such guests, the hotel will feature price points notably lower than at many other hotels in the core of the city, with rooms starting at about $150 a night. The developer also is redoing the building’s large courtyard — behind a brick wall on Berkeley Street — to house an indoor-outdoor restaurant. The basement will become a bar that doubles as co-working space during the day. Mount Vernon, and the operator, Provenance Hotels, hope the Revolution’s creative vibe and unusual theme will help set it apart in a market that has seen a string of new boutique hotels open in the South End and other nearby neighborhoods. Earlier this year, the Chandler Inn, nearby at Berkeley and Chandler streets, reopened as the upscale Alise Boston, while the Kimpton Nine Zero on Tremont Street downtown unveiled a $10 million redo. Meanwhile, fairly new properties such as the Verb in the Fenway and the Godfrey in Downtown Crossing have expanded the map of hip hotels in Boston. But even among boutiques, let alone the chain hotels that dominate the market, a former YMCA-turned-innovation-themed-hotel — with shared bathrooms — is unique in the market.